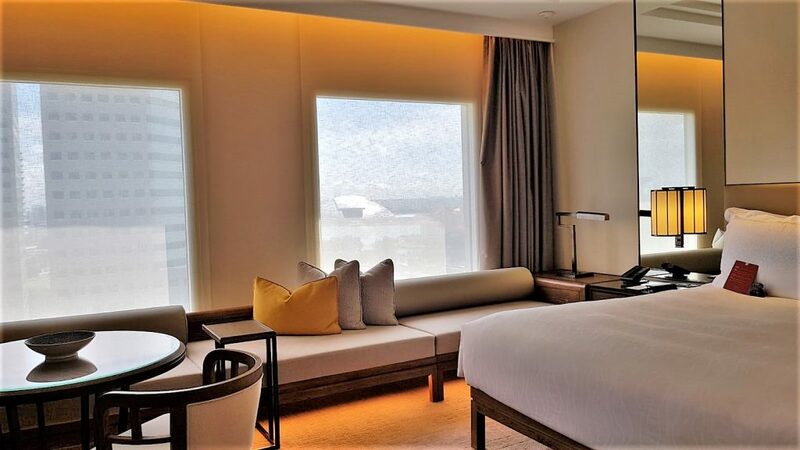 The hotel is located 20 minutes from Singapore Changi airport in the Millenia/Suntec City area of Singapore. It is walking distance to the Marina Bay Area and many of the major shopping centres. We arrived at the hotel at 10 am and our luggage was taken from the car by the porters. The welcome was friendly. We then were escorted to reception where we were greeted warmly and completed check-in very quickly. We were only staying for one night before the Grand Prix. As I had a busy day of engagements planned I just booked a Grand Deluxe King room without Lounge Access (I know so unlike me!)) as I wouldn’t have time to use it. For me, the main benefit was free breakfast. The general lobby area does look jaded. It has a 1970s faded bling about it with a sweeping staircase and lots of dark wood. 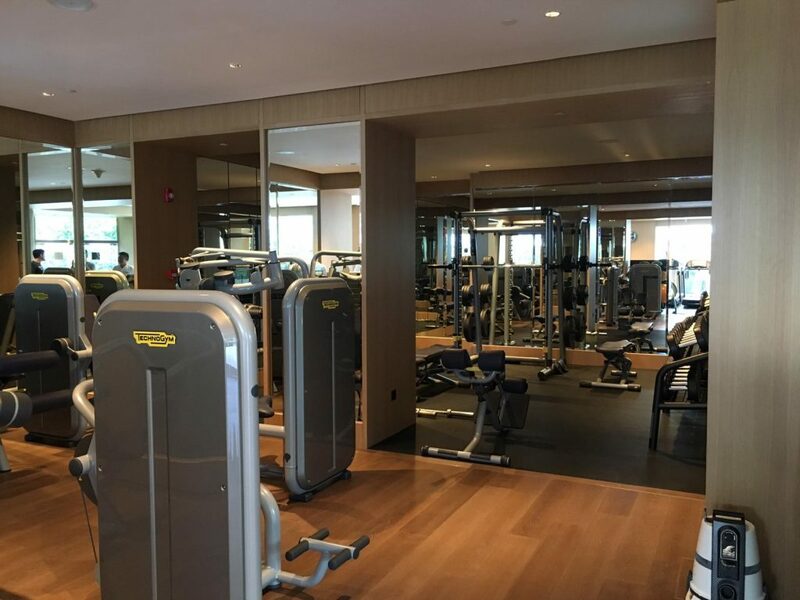 Initial impressions were not thrilling, but fortunately, they have started a major renovation of the rooms. 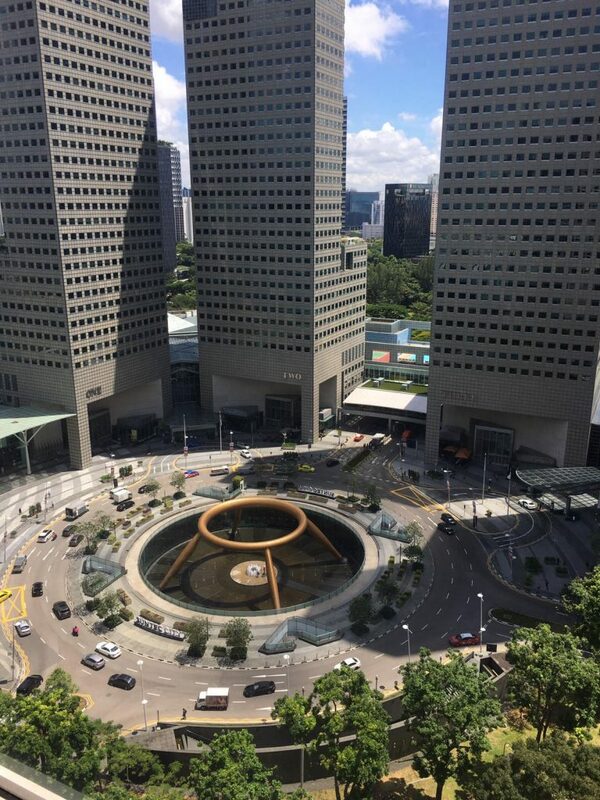 We were allocated a room on the 25th floor that had a superb view over the Fountain of Wealth. 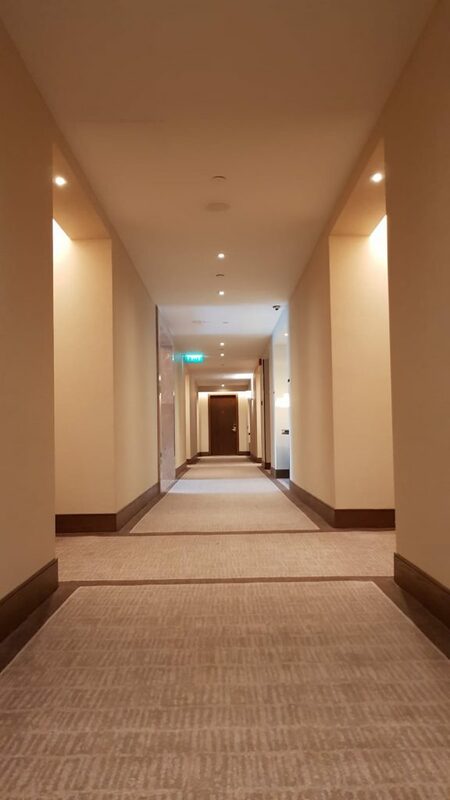 The hallways had been freshly redecorated (the odour of fresh paint was pungent) and the carpets felt plush as we walked along. The room was more spacious than I had expected but a sea of beige with some yellow accents. There was a very long couch which extended the length of the room and a small table with two chairs. We found the bed large and reasonably comfortable, and we slept well. The blinds were automatic with sheer and blackout versions. The bathroom was very nicely appointed and had the Shanghai Tang Mandarin Tea products which is the usual Conrad brand in Asia. There were standard towelling robes, an iron and board, and of course the Conrad Teddy Bear on the bed. As you would expect there was a standard mini bar, but there was both a Nespresso machine and kettle. Plenty of hotel branded still water was available. 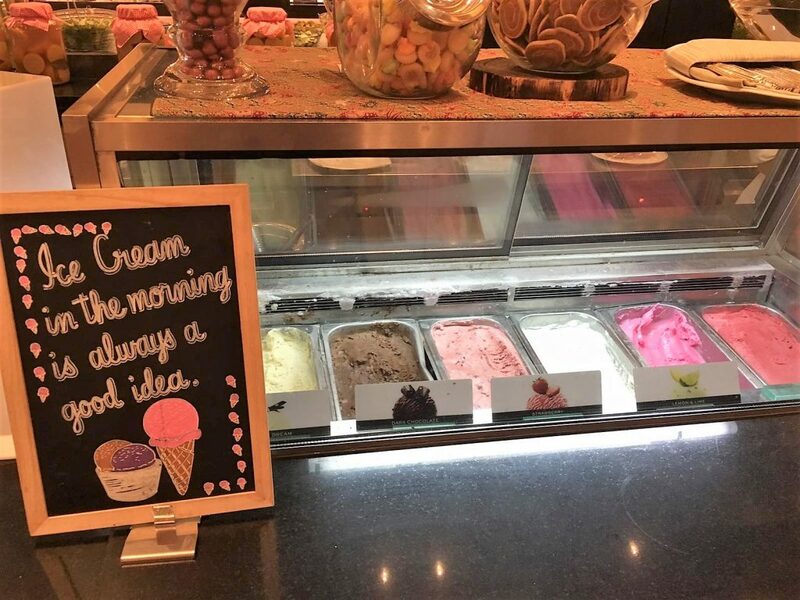 Breakfast was buffet style in the hotel’s Oscars restaurant. It was absolutely heaving when we arrived at 9 am. The service was frenetic, and staff were all over the place trying to keep on top of demand. 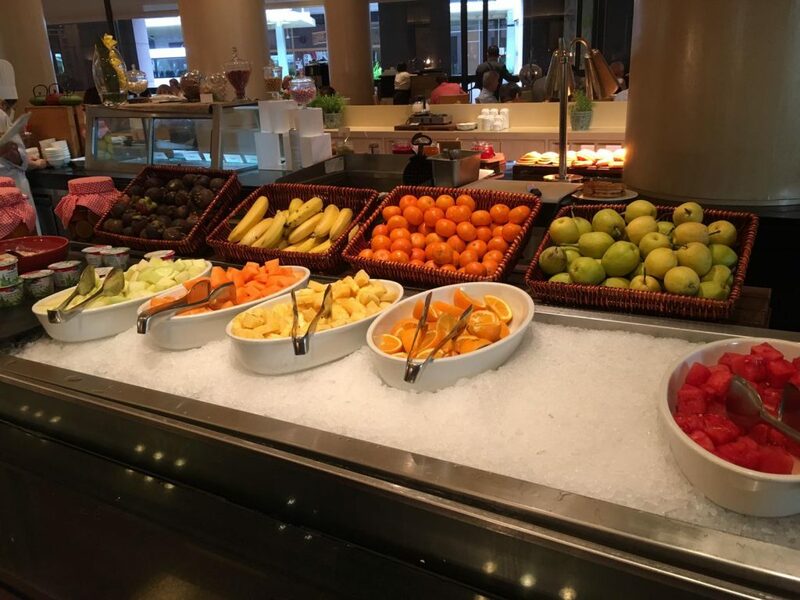 However, the selection was excellent and extensive; all standard 5-star hotel fayre but there was a great juice station and even an ice cream selection! I enjoyed my breakfast but the ambience was too frantic for me. There is a good sized 20m pool, and a recently enlarged gym has been installed. 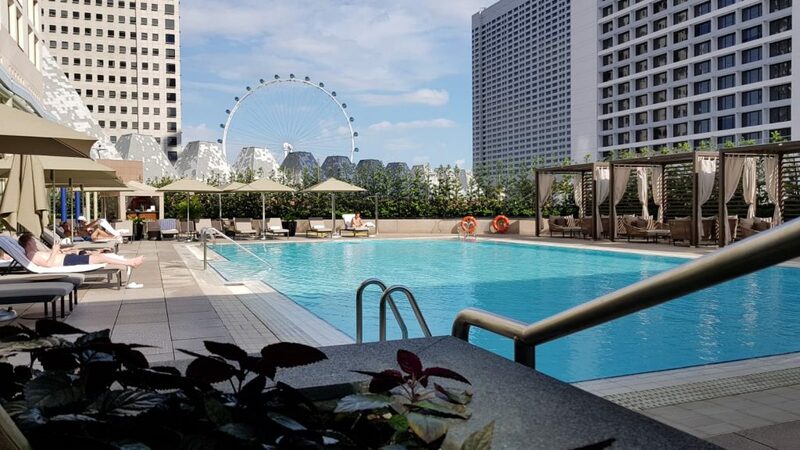 The pool was OK but other than the view of the Singapore Flyer, not one of the most attractive pools in Singapore. Four restaurants are on site though I didn’t have an opportunity to try them plus there is a spa. Check out was as swift as Check-in, friendly but not overly so. 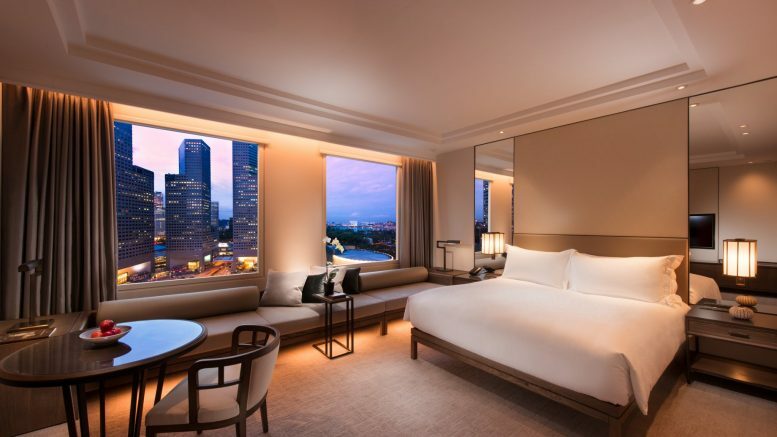 In the last 12 months, I have also stayed at the both the Mandarin Oriental and the newer JW Marriott in Singapore. I liked the room at the Conrad as it was fresh and nicely appointed. My suite at the MO was much larger but was very dated and the rooms at the JW Marriott could induce dizziness (the pattern on the carpets is something else!). I’d be happy to sleep at the Conrad but probably wouldn’t spend too much time anywhere else within the hotel. I paid SGD332 (ca. £185) for my room which I believe represented very good value for my stay. 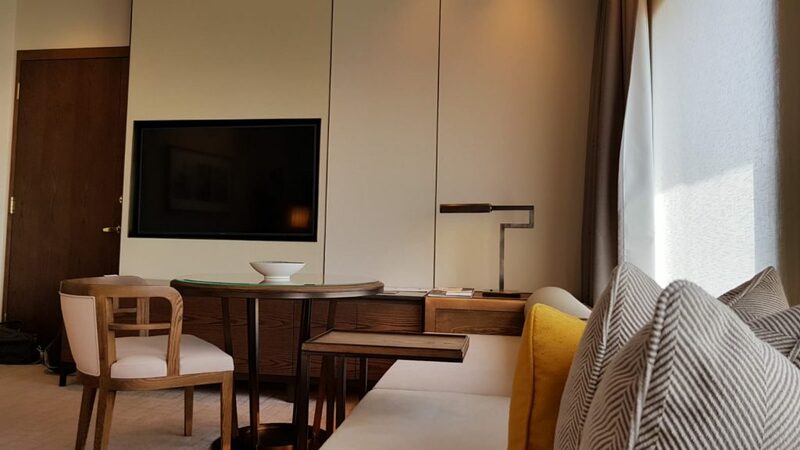 Hilton London Bankside review – is this the best Hilton property in London? 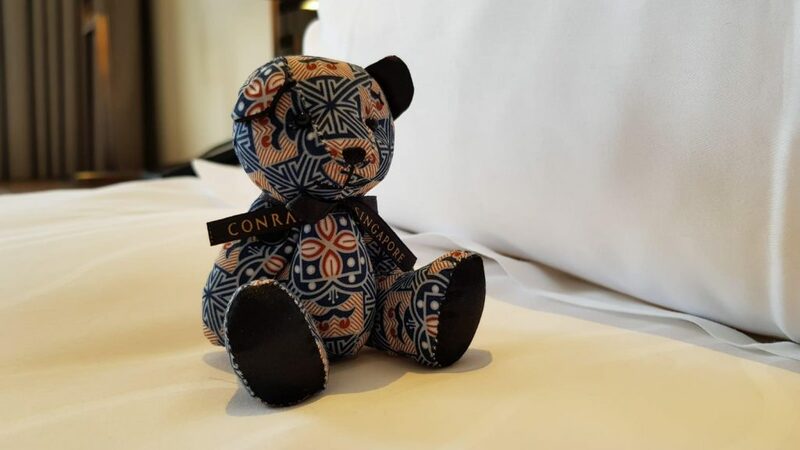 1 Comment on "Conrad Centennial Hotel Singapore review"
I’ve stayed at the Conrad and the Westin in Singapore but I am currently in the Marriott Tang Plaza. It is an iconic building on the Orchard Road and has one of the best lounges – 4 hours of alcohol and two 2 hour food sessions for Main courses and desserts. The pool is 15m*15m. 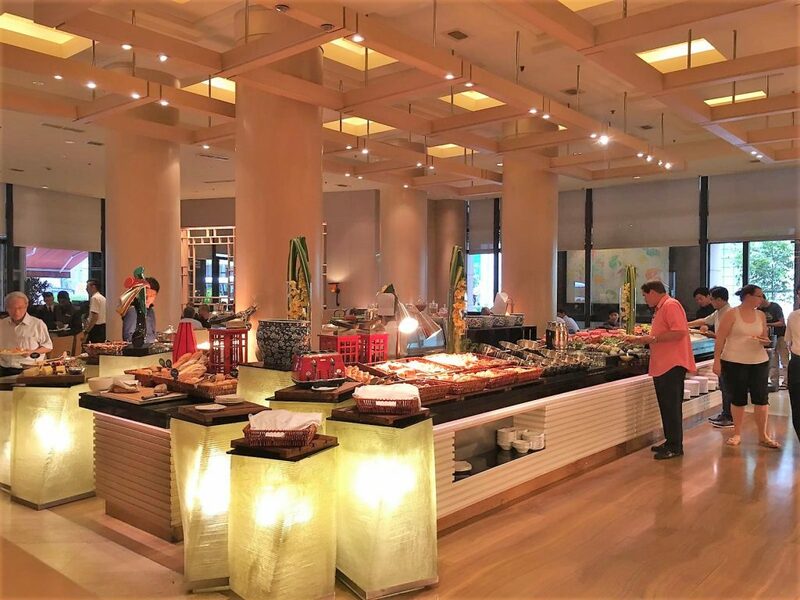 Excellent buffet breakfast for Platinum members. Well worth a visit and some floors are renovated including 30 where we are staying.